Amoxycillin is a semi-synthetic penicillin with a broad bactericidal activity against Gram-positive and Gram-negative bacteria. The range of effect includes: Streptococci, not penicillinase producing Staphylococci, Bacillus anthracis, Corynebacterium spp., Clostridium spp., Brucella spp., Haemophilus spp., Pasteurella spp., Salmonella spp., Moraxella spp., E. coli, Erysipelothrix rhusiopathiae, Fusiformis, Bordetella spp., Diplococci, Micrococci and Sphaerophorus necrophorus. The bacterial activity is governed by an inhibition of the formation of the cell. The excretion takes mainly place via the urine and bile so that amoxycillin is also useful for the treatment of renal and Salmonella infections in the intra-hepatic billiary tree. 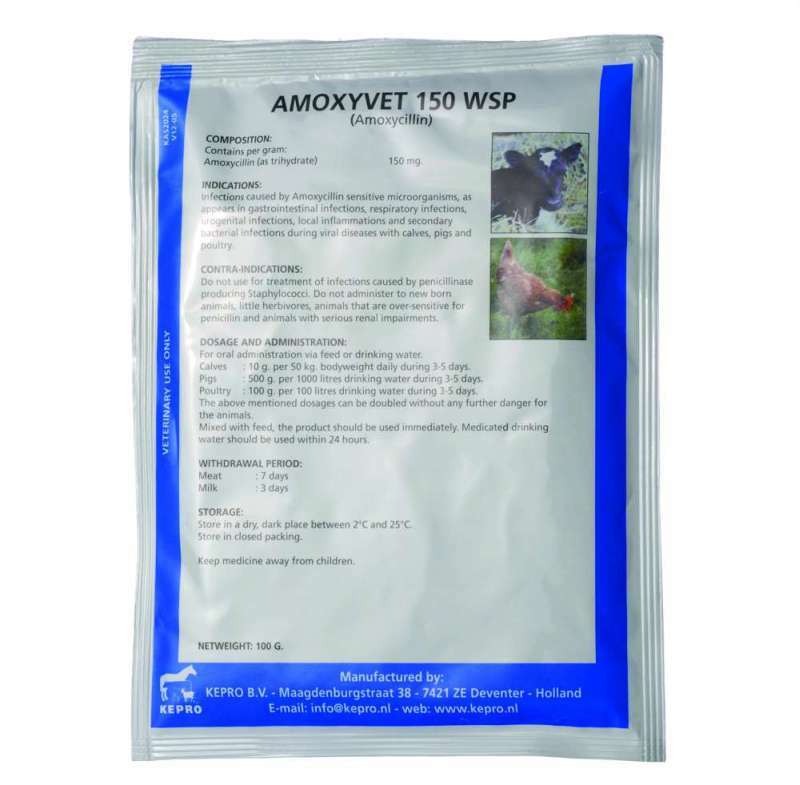 Amoxyvet 150 wsp is effective against infections caused by micro-organisms sensitive to amoxycillin like gastrointestinal infections, respiratory infections, urogenital infections, local inflammations and secondary bacterial infections during viral diseases with cattle, calves, pigs and poultry. Do not administer to animals hypersensitive to penicillin. Cattle, calves : 10 g per 50 kg bodyweight daily, during 3 – 5 days. Pigs : 500 g per 1,000 litres of drinking water during 3 – 5 days. Poultry : 100 g per 100 litres of drinking water during 3 – 5 days. The above mentioned dosages can be doubled without any danger for the animals.